^ Warren, Tom (February 11, 2014). "Windows Phone 8.1 includes universal apps and lots of feature updates". The Verge. Vox Media. ^ a b Reilly, Claire (October 8, 2017). "Windows 10 Mobile gets its final death sentence". CNET. Retrieved October 9, 2017. ^ Bell, Donald (February 16, 2010). 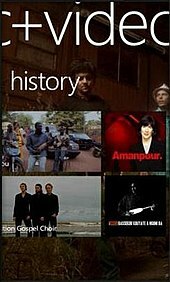 "Zune services going global with Windows phone". CNet. ^ Sherman, Joshua (September 30, 2015). "Goodbye Windows Phone! Windows 10 will take it from here". Digital Trends. ^ Haselton, Todd. "Microsoft recommends switching to iPhone or Android as it prepares to kill off Windows phones". CNBC. CNBC LLC, a Division of NBCUniversal. Retrieved January 19, 2019. ^ Weintraub, Seth (February 8, 2011). "Nokia's Elop drops bomb: the platform is on fire". CNN. Retrieved June 14, 2013. ^ Latest Video (June 1, 2011). "Nokia CEO Stephen Elop Chooses Microsoft Windows Phone OS Over Android - John Paczkowski - D9". AllThingsD. Retrieved June 14, 2013. ^ Lev, Michal (September 5, 2012). "Can the Lumia smartphone save Nokia? - Fortune Tech". CNN. Archived from the original on September 7, 2012. Retrieved June 14, 2013. ^ Wann, Michael. "The Next Chapter: An open letter from Steve Ballmer and Stephen Elop". The Official Microsoft Blog. Microsoft. Retrieved September 3, 2013. ^ Pierce, David (September 2, 2013). "Microsoft buys Nokia's Devices and Services Unit, unites Windows Phone 8 and its hardware maker". The Verge. Vox Media. Retrieved September 3, 2013. ^ Warren, Tom (February 27, 2012). 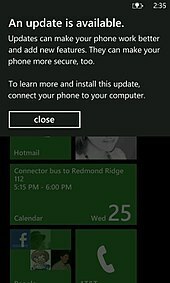 "Windows Phone 7.5 update will support 256MB RAM and slower processors in April". The Verge. Vox Media. Retrieved June 21, 2012. ^ Miles, Stuart. "Windows Phone 8: New hardware specs offer a new start". Pocket Lint. Retrieved February 5, 2013. ^ "Windows Phone just died". Techradar. Future PLC. Retrieved January 21, 2015. 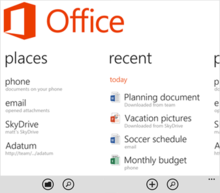 ^ "Windows 10 for mobile detailed with PC syncing, better voice commands". Techradar. Future PLC. Retrieved January 21, 2015. ^ Andrew Cunningham (January 21, 2015). 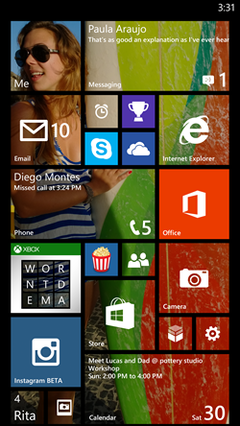 "Our first look at Windows 10 on phones, and Universal Apps for touchscreens". Ars Technica. Retrieved January 23, 2015. ^ "Microsoft reneges on Windows 10 upgrades for all current Lumia phones". PC World. IDG. Retrieved January 23, 2015. ^ Melanson, Donald (February 6, 2010). "Rumored Windows Phone 7 details surface ahead of MWC launch: Zune-like UI, no multitasking". Engadget. AOL. Retrieved June 14, 2013. ^ "Sync music, ringtones, and podcasts using my computer". Retrieved January 2, 2015. ^ "Have a new Windows Phone feature idea? Try Suggestion Box". Windowsteamblog.com. September 28, 2011. Retrieved December 16, 2013. ^ "The new Windows Phone 8 manufacturer... that you've probably never heard of". Neowin. Retrieved July 11, 2013. ^ "Gartner Says Worldwide Mobile Phone Sales Declined 1.7 Percent in 2012". Gartner.com. February 13, 2013. Retrieved June 14, 2013. ^ "Gartner Smart Phone Marketshare 2013 Q4". Gartner, Inc. Retrieved January 13, 2014. ^ Liao, Shannon (August 28, 2017). "New York City cops will replace their 36,000 Windows phones with iPhones". The Verge. Retrieved August 29, 2017.